"You're listening to Browse FM! 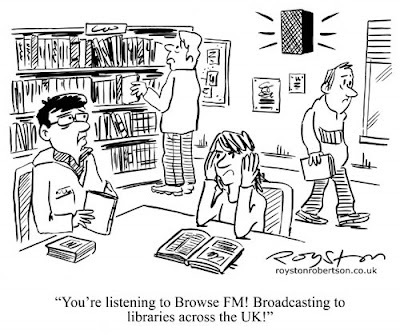 Broadcasting to libraries across the UK!" Unwanted piped music seems to be wherever you go these days. So when trying to come up with a cartoon on that theme, in February of 2008, I decided to think of what would be the most outrageous place you could have piped music. The library was the answer I came up with, and the cartoon above was the result. Now, you may have seen this news story last week: Libraries criticised for playing music. Yes, it's another case of life imitating cartoons! And as the gag did not sell, it proves that punctuality is crucially important with topical cartoons i.e. just as a cartoon that is created too long after the event is useless, so is one that arrives too early! Oh, and in case you missed it, here's my first Life imitating cartoons post, from last October. Be careful what you draw Royston. You seem to be predicting the future with your cartoons. How about a cartoon about next weeks lotto numbers? Dunno about Lotto numbers, but I'm currently working on a cartoon showing the Editor of Private Eye on the phone. He's saying: "We'll take ALL of these gags, Royston, send more right away!" Grumpy Old Man addition: I love to do a bit of doodling and idea brainstorming on the train, half an hour of just you and the sketchbook. But not since they installed TV's in almost every carriage repeating the same out-of-date news feeds over and over. Grrrr. Hi John, yes I also do brainstorming on the train. And I get almost two hours, on the trip to London. But my distraction is "yoofs" playing tinny R'n'B on mobile phones and talking very, very loudly. Grrrr.